David – “Dear, I shrunk inflation expectations”! David, this is simply horrific numbers. The euro crisis has caused Bernanke to fall way behind the curve – once again. This in my view clearly shows the problem of not having a clearly defined monetary rule. So the Fed already broke its employment mandate. Now they’re breaking the price stability mandate (as they themselves formulate it, they’ve time and again confirmed the 2% is not a ceiling). So why isn’t this a highly incompetent Fed? All I can say is that he’s doing better than Draghi, which is really not saying anything. Can not we ever declare victory in the war against inflation? Or the war against economic growth? Do we have to do a Bank of Japan? A good but disturbing observation. Most disturbing is thinking that, if these inflation expectations don’t provoke a change, then basically things have to look catastrophic for the FOMC to do anything. Even in mid-2010, there was less justification for action than now, and the FOMC had the good sense to act then. Perhaps the historical American parallel is not so much with the 1930s, but the 1960s, 1970s and early 1980s, when policymakers repeatedly only acted to stave-off inflation when things were awful and even then only temporarily. Given that pattern existed in your history for about 15 years (the 1967 squeeze until the post-1982 moderation) and the had “stop-go” and “go-stop” policies from about 1919 to 1993 (with the notable exception of 1931-1945) we could be in for a long-period of bad macroeconomics policy. I don’t want to be alarmist, but that 1919 to 1993 period doesn’t just happen to coincide with the UK’s decline as a world power, ending with the final humiliation of Black Wednesday in September 1992. There’s no reason to think that the US may not undergo a similar decline, if monetary policy isn’t fixed. It could be argued that you’re already well down that road and the pseudo-solutions offered by left and right are not encouraging. It’s tactical thinking, as opposed to strategic thinking, and one of the better arguments for abolishing central banks is that monetary policy is too important to depend on the appointment of a set of strategic thinkers. The Cleveland Fed’s estimate seems implausible to me. The 10-year TIPS breakeven is 2.16% (assuming I’m reading the quotes and doing the calculation correctly). This implies an inflation risk premium of at least 97 basis points (probably significantly more because there is also a liquidity premium that should raise the yield on TIPS relative to nominals). That just doesn’t seem at all reasonable, unless people think there’s a really big tail risk, that the Fed will change its mind about its 2% target and go for something like 4%, or maybe decide to implement the target as a retroactive NGDP level path target so that it can allow a lot of temporary inflation while sticking to its longer-range goal. The latter isn’t entirely out of the realm of possibility, but is it a big enough risk to justify a full percentage point risk premium? If that’s the case, the situation is even worse than you put it, because that possibility is pulling up the average, so, conditional on the absence of such a dramatic change, the expected inflation rate is even lower. But I just don’t find that view plausible. I think the Cleveland Fed is misreading the indicators. Texas oil production is at 20 year highs. The Cleveland Fed indicator is based on zero-coupon inflation swaps, and these in turn are priced off of expected headline inflation (as are TIPS). Headline inflation is highly volatile, most of this volatility due to gasoline prices. The collapse in TIPS rates and inflation swap rates may be due to something very healthy; a fall in oil + gasoline prices due to a renewal in US oil production and a rebirth of the once-decaying US onshore oil industry. In other words, there may be a very real component to the decline in inflation expectations, and less of a monetary component. my point was that we need a good rule, not just any rule. A rule that responds for example to the CPI when import prices are rising is a bad rule. I’d rather have no rule than a bad rule. 1982 must have been a bad time to be around. Even though 7 percent is still easily manageable. Considering that hyperinflation occurs at 50 percent. Lars, Especially if the rule implies the correct policy. Christiaan, If you are expecting me to defend the Fed, I’m afraid that you will be disappointed. But if the standard of performance is the ECB, I guess one could say in the Fed’s behalf that they could have done worse. That would be really faint praise. Benjamin, Some wars never end. W. Peden, You are taking the discussion of monetary policy to a whole new level. I’m not sure what the significance is of the 1919 to 1993 bookends of the period that you singling out for special attention or why you think 1931-45 is an exception, so I am not really in sync with your thought process. On the other hand, I do find the analogy that you draw between excessive focus on full employment in the late 1960s and 1970s and excessive focus on inflation in the period since 2008 a very interesting idea. dwb, Thanks for explaining that to us. Andy, I don’t understand how the Cleveland Fed makes those estimates. However, if you look at their graphs and tables you will see that their estimates of short-term real interest rates have shot up in the last two months. So you can’t just look at the breakeven TIPS spread and infer that that that spread is broken down between inflation expectations and the inflation risk premium. 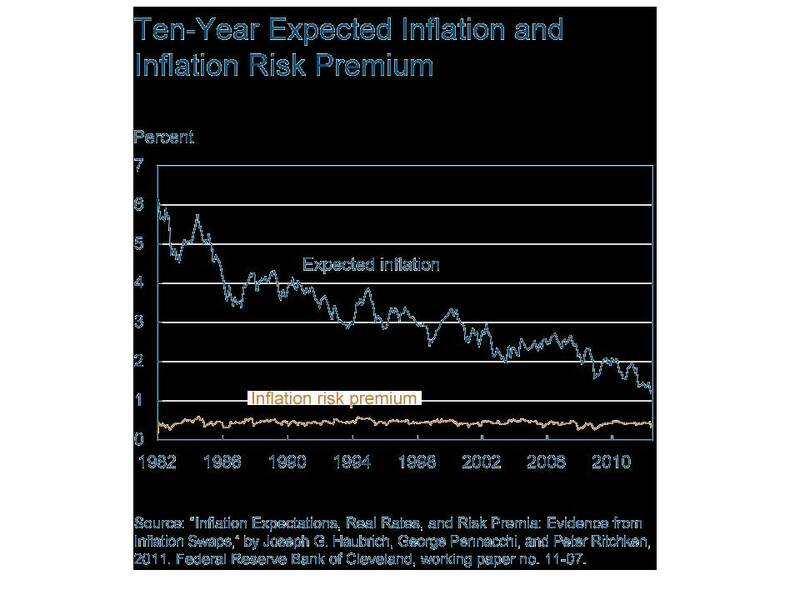 In their estimates the risk premium is fairly flat, and they are estimating that real rates are rising (because of liquidity effects, I assume) while inflation expectations are falling. Julian, Yes, it will be interesting. But the chances for a recovery getting under way without a bid dose of monetary stimulus do seem to have evaporated since the early spring, when hopes were rising. JP, Thanks for the link. I don’t think that a recovery in US oil production is driving oil prices down. However, the recognition that there is a developing technology that will allow greatly enhanced production in the US and in many other places is certainly shifting market expectations of future prices down, which makes holding inventories a lot less attractive than it was until recently. That said, I agree that the recent drop in inflation expectations has been influenced by the changing dynamics of world oil markets, not only monetary policy. Insofar as falling inflation expectations are driven by a positive oil supply shock, that reduction is benign. dwb, Right, see my response to Lars above. Tas, I remember 1982. It was scary, but not nearly as bad as 2008. JP Koning is spot on about the influence of shale oil (and indirectly shale gas) on crude prices, and I wrote in March that we should expect this to happen (lower crude prices, dragging down breakevens, especially short term breakevens). David – market monetarists cannot have it both ways without losing any pretence at intellectual coherence. They cannot on the one hand say that the collapse in TIPS breakeven spread post July 2008 reflected imminent and realistic fears of a depression and that the move in prices reflected real expectations rather than an increased risk premium due to temporary supply/demand imbalance; and on the other depend on a model (the one that underlies the Fed paper) that suggests this move in breakevens was a mere cheapening of an illiquid product under a distressed scenario where liquidations abounded. If you believe the Cleveland Fed paper, you must admit that the situation post July 2008 was not nearly as bad as one would expect solely based on the move in breakevens. On the other hand if you emphasize the breakeven move, you must think there is something wrong with the Fed approach. Furthermore, since deflation is only really a risk to the extent it impinges on either nominal wage growth or nominal asset pricing, shouldn’t you rather focus on direct measures of such? My sense has been that peoples expectations about wage growth in the US have stabilized and are starting to improve. Similarly stocks are not too far from their highs. So on what basis is it that you argue we ought imminently to fear the arrival of bad deflation? cantillonblog, You make a fair point. One ought to distinguish between falling expectations that are associated with a positive supply shock. The problem we have is that it is hard to disentangle the causes of the recent drop in crude oil prices. It seems to me to reflect expectations of a falling demand for oil because of expectations of a weakening economy and expectations of an increasing supply of oil and natural gas, because of recent discoveries of new sources of oil and gas and the rapid development of new extraction technologies. I also agree that the breakeven TIPS spread cannot always be interpreted in a straightforward fashion, particularly when there are sharp breaks indicating that markets may not be functioning or that the option value of the TIPS is starting to dominate its pricing. But, even given those qualifications, tracking the TIPS spread provides a good indication of the direction in which inflation expectations are moving. My view is that inflation is already too low and therefore further downward movements in inflation expectations are more likely to portend a deterioration than an improvement in economic conditions. But I accept your point that a sufficiently large positive supply shock could alter the otherwise likely effect of falling inflation.